Taking a close look at the issue of the arts and school reform, this book explores in detail how the incorporation of the arts into the identity of a school can be key to its resilience. 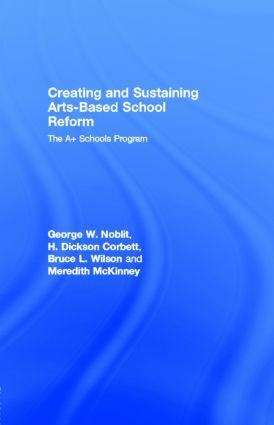 Based on the A+ School Program, an arts-based school reform effort, it is much more than a report of a single case - this landmark study is a comprehensive, longitudinal analysis of arts in education initiatives that discusses the political, fiscal, and curricular implications inherent in taking the arts seriously. Offering a model for implementation as well as evaluation that can be widely adapted in other schools and school districts, this book will inspire arts educators to move from advocating more arts to advocating the arts as a way to reform schools. Administrators and policy makers will see how curriculum integration can be used to revitalize and energize schools and serve as a springboard to wider reform initiatives. Researchers and students across the fields of arts education, school reform, organizational change, and foundations of education will be informed and enlightened by this real-world scenario of large-scale school reform. George W. Noblit is the Joseph R. Neikirk Distinguished Professor of Sociology of Education and Chair of Culture, Curriculum and Change in the School of Education at the University of North Carolina at Chapel Hill. H. Dickson Corbett is an Independent Educational Researcher conducting evaluations of school reform initiatives. Bruce L. Wilson is an Independent Educational Researcher engaged in longitudinal research and evaluation projects focused on improving teaching and learning conditions in schools with populations of high poverty. Monica B. McKinney is Associate Professor, School of Education, Meredith College.